Here’s a common scenario: you have your cell phone charging in your vehicle, maybe a corded GPS, plus a radar detector and another cord, plus all your other devices charging with even more cords. What a tangled mess and a distraction as well! Organize your car, untangle those cords and hide the ones that live in the car permanently. 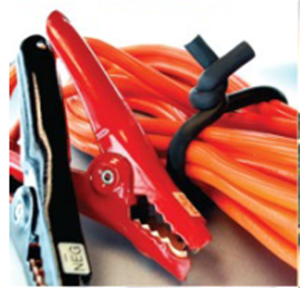 UT Wires has the solution; the new D-Wings and Flexi Ties will organize the inside of your automobile and are also perfectly suited for decluttering your trunk and the garage. I was impressed with the quality and ease of use when organizing the cables and cords inside my car. These ties are reusable and can be joined together for bigger items like jumper cables. The soft opening slits make it easy to insert or remove the cords. Guide and hold cords around corners, edges or curves. Use it on flat surfaces to hold cords in place. Self Adhesive with 3M foam tape that will not leave holes on surfaces. Best of all, the prices were very reasonable and retail for under $10. I found them at Pep Boys but also available online at www.ut-wire.com.